Paul Martin was the best basketball player in Elk River. Best hockey player, too. As a high school freshman, Martin was a regular at captains’ practices for both sports. Of course, once the season started, he would have to make a choice. Hockey or basketball. Basketball or hockey. But which would it be? 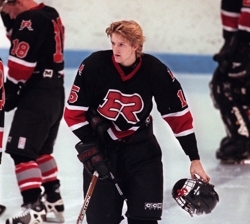 No one was more interested in Martin’s decision than Elk River hockey coach Tony Sarsland. The Elks’ first practice that season was held early in the morning, and Sarsland was bursting with anticipation. Finally someone told Sarsland they thought they had seen Martin in a far locker room. Sarsland eagerly poked his head inside the door and, sure enough, there sat Martin. Sarsland, attempting to remain calm, returned to the coaches’ room. “I went back inside and went, ‘Yeah!’ ” Sarsland said. Martin was a varsity regular right away that season. Lanky and lean (Martin stood more than 6-feet and weighed about 170 pounds), the defenseman possessed an uncanny ability to see the ice, anticipate plays and make decisions as quickly and efficiently as a computer processing algorithms. 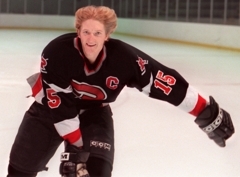 Sarsland, who is entering his 27th season as Elk River’s coach, had such an unshakable trust in Martin that he took the unprecedented step of giving the defenseman carte blanche in decisions regarding ice time. 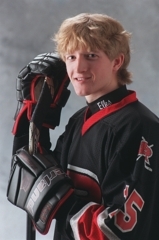 Martin was a junior in 1999 when Elk River upended Duluth East 4-2 in the Section 7 semifinals at the Duluth Entertainment and Convention Center. Two nights later the Elks headed north to play Hibbing in the section championship game at a packed Memorial Building Arena in Hibbing. Hibbing coach Mark DeCenzo had scouted Elk River in the section semifinals, and he remembers being stunned by the amount of ice time Martin was logging. Martin’s endurance was tested to the extreme in the section title game against the Bluejackets. The game was extended to three overtimes. Martin never left the ice in the overtime sessions. Elk River won 2-1 to secure the second state tournament berth in the program’s history. “I was standing a lot father back than I normally would,” Martin said. “I would just get the puck and spank it up off the boards. I remember getting that feeling of relief after we won. Martin had three assists in Elk River’s 5-1 Class 2A quarterfinal win over Hill-Murray at the Target Center in Minneapolis. “That was larger than life for me,” Martin said about playing in the state tournament. “A high school kid playing in such a big building. You have never played in a scene like that. Hastings outlasted Elk River 2-1 in two overtimes in the semifinals, with Martin assisting on the Elks’ lone goal. Martin scored a goal as Elk River beat Holy Angels 3-2 in overtime to take third place. 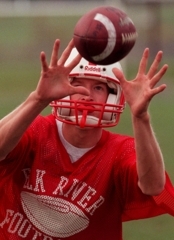 Martin was one of two Elk River players named to the 12-member all-state team. Elk River failed to reach the state tournament the following season. The Elks blew a four-goal first period lead in a 5-4 double overtime loss to Osseo in the Section 4 semifinals. Elk River had defeated the Orioles twice during the regular season. 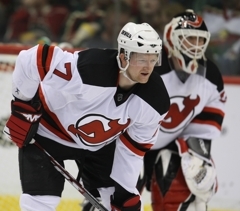 “I think as soon as we lost that game I wanted to forget everything about it,” Martin said. “During the year we never really had many close games. You are not cocky, you just believe in everyone on your team. It was just one of those games that slowly started to slip away from us. Blaine, a team Elk River had defeated in lopsided fashion twice during the regular season, went on to win the Class 2A title. 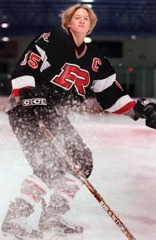 Martin, who was named Mr. Hockey in the spring of 2000, was equally accomplished as a football player. A star wide receiver, he ranked first in the state in career receptions and yards and was second in career touchdown catches when he graduated. He still ranks in the top seven in all three categories. 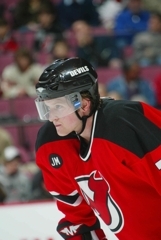 Martin went on to win NCAA titles with the University of Minnesota in 2002 and 2003. 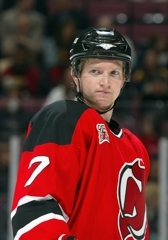 He was drafted in the second round, 62nd overall, by the New Jersey Devils in 2000. He played six seasons in New Jersey before signing a free-agent contract with the Pittsburgh Penguins before the 2010-11 season. Martin has 3 assists in 10 games for the Penguins this season.